As of this year, hundreds of people are involved in the group now called “Right Relationship Boulder” (RRB). 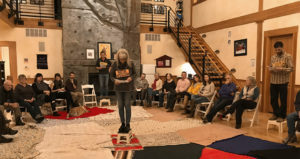 Municipalities are coming to the table to weave in policy, the school district is on board, and—most importantly—two groups of people of the Arapaho tribe from Oklahoma and Wyoming are connected to the people and the land of their ancestral home. This is coming to fruition in RRB’s “Welcome the Arapaho Home” initiative. Today, we ask: How did we get from there to here? The answer: slowly. I often joke that we are a slow-cooker organization. We are patient about community development. We take time to percolate and consider, but at the end of the day serve up a meal that nourishes us for much time to come. We have come a long way, and have some great meals to show for our efforts. Now’s the time to write the recipe. We might consider that this started with, as Rio urged in the quote above, being in it together. Philanthropiece members met with, listened to, and championed the efforts of Paula Palmer, Jerilyn DeCoteau, and others to further develop and promote more workshops. We provided financial resources and a fiscal sponsorship so that the group could function and grow, and we have dedicated significant staff time to the initiative. We later hosted sessions and retreats for RRB. And we didn’t just show up on the day of the event. We were there before and after. We witnessed RRB question their purpose, key activities, and organizing principles. We had our hands in communications, event planning, volunteer coordination, and all of the nitty-gritty details in between. We showed up: consistently, in excitement, in frustration, and in the in-between. This is what a movement looks like. This is a living chronology, one that grows and breathes. It’s easy to want to get from A to B, to chow through a to-do list, to glance over the work that has brought us here. As we have been considering who we are and what we do at Philanthropiece, I can’t help but reflect on our role in RRB. We’ve cultivated relationships and worked together with friends and fellow changemakers to co-create an initiative that we anticipate will lead to wellbeing in our community and beyond. This has been done with patience and humility as we listen to the leaders and take responsibility for what we don’t know by learning alongside others in the movement. We have asked questions related to equity and inclusion throughout this process: Who is at the table when a decision is being made? What voices are here, and what voices are not present? Are we considering all Native groups who have considered this area their homeland? In just a few days, hundreds of people will gather at Boulder High School to welcome the Arapaho to their Boulder Valley homeland, as they share their culture, history, and current lives through presentations and performances. We will be present for that. And what’s next? This grassroots movement has so much momentum and energy, and at this time we feel poised to collaborate with its leaders to sustain it. We exist to build connection, to converse and to listen, to improve people’s lives, to build community, to right the injustices that we know to be true in our world. This is no easy task, and one that doesn’t happen overnight. And it’s a mission that requires cultivating relationship first and foremost. We are proud to play a role in co-creating Right Relationship Boulder and being part of the critical social movement to recognize Native peoples. Katie Doyle Myers is Philanthropiece’s Executive Director. She grew up in Lancaster, PA, traditional territories of the Susquehannock. Edited by Raye Watson.